» Are We Sure That Bill Parcells Is the Right Guy for the Saints? While Sean Payton is appealing the year-long suspension that NFL commissioner Roger Goodell laid down as part of Bountygate, it seems unlikely that the appeals court — namely, Roger Goodell — will find any reason to significantly shorten or remove his suspension from the books. Sorry, Jimmy Buffett. 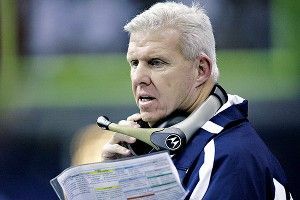 That uncertain future has led Payton to line up one Bill Parcells as a possible short-term replacement as Saints head coach for the 2012 season, and it’s a move that Parcells is apparently considering. On paper, it’s an easy case: Head coach with a sublime track record of success comes in to coach his protégé’s team for one season in the hopes of winning a third Super Bowl before quitting for good (again). When Parcells has taken over as the new head coach or football czar of an organization he wasn’t previously involved with, he’s improved that team’s win-loss record by an average of 6.5 wins during his first season. So let’s pencil in the Saints to go 19 and negative 3 next year, right? In the excitement of replacing Payton with a coach of Parcells’s pedigree, though, one question appears to have been just about ignored: Is Bill Parcells really a good fit for these specific New Orleans Saints? The evidence suggests that he isn’t really the right answer for the Payton problem in New Orleans. Start with the basic archetypes surrounding Parcells and Payton. As the head coach of the Saints, Payton’s called plays for a hyperaggressive passing offense that frequently takes risks on fourth down and in unlikely situations, like the famous unexpected onside kick against the Colts in Super Bowl XLIV. Whatever success his team has had running the ball has come as a consequence of that passing game. On defense, Payton’s teams have played in a 4-3 alignment, regardless of the defensive coordinator, and new defensive coordinator Steve Spagnuolo has spent his entire NFL career in the 4-3. Parcells, meanwhile, is a conservative coach who tends to build his offenses around a sound running game and almost always employs a 3-4 defense. What’s made Parcells so effective in turning around organizations, in fact, has been his ability to dramatically improve their defense by moving them into a 3-4 and acquiring the talent to properly implement his scheme. In Parcells’s five stops around the league (including his four head coaching gigs and his role as the “czar” in Miami), only once has his team not played in the 3-4 during their first season with Parcells as head coach. That was with the Cowboys, and even they moved to the 3-4 after two seasons in the 4-3. Although the shift in philosophy tends to take two to three years to complete, Parcells has been able to produce instant results. Excluding his run with the Giants, where he was defensive coordinator before becoming head coach, Parcells’s rescue work has seen him take over four defenses who were, on average, 24th in scoring defense before his arrival. In Parcells’s first year with the new team, those defenses have improved to an average rank of seventh. That would do nicely for the Saints, who were a respectable 13th in scoring defense last season, but the circumstances are going to make it extremely difficult for Parcells to work his magic. Those improvements were driven both by the aforementioned scheme change as well as an influx of new personnel, which usually included a group of Parcells favorites from his previous stops around the league. When Parcells took over with the Jets, for example, he changed six of the team’s 11 starters on defense during his first season while bringing in Giants mainstay Pepper Johnson as a coach at middle linebacker. When Parcells later went to Miami, he brought in former Cowboys players Akin Ayodele and Jason Ferguson as two of five new starters on the defensive side of the football. If Parcells takes over as the new Saints coach in April, he won’t have the benefit of free agency to bring in the sorts of players he would want as part of a 3-4 alignment. In addition, even if he had been around when free agency began, there simply aren’t many Parcells favored sons left rumbling around the league. Ferguson, who played for three different franchises under Parcells, is out of football. Veterans like Bradie James and Terence Newman could find their way to New Orleans if Parcells did want to play in a 3-4, but there’s a good reason that they’re not attracting any interest from 3-4 defenses in free agency. In addition, one of the subtle reasons why Parcells has managed to be so effective in his new stops is that he’s inspired his defenses to stay healthy. Whether that’s blind luck or some aspect of the physical constitution that Parcells has identified in successful football players is impossible to say, but it’s hard to argue with the results. In 2008, Miami’s 11 starters on defense combined to miss just one game all year. (In fact, they were pretty healthy on offense, too: Remember that those Dolphins got 16-game seasons out of both Chad Pennington and Ronnie Brown when the two had combined for just one healthy season in 10 beforehand.) The Cowboys’ defensive starters only missed a total of two games in 2003, and 10 of the 11 regulars on the Jets’ defense in 1997 made it through 14 games or more. If Parcells doesn’t have his sort of personnel on defense, can he produce that sort of dramatic swing in health again? And if he doesn’t exhibit that incredible ability to keep his best defenders healthy, will he produce the same results that he has elsewhere? That’s a huge chunk of the core of five different Super Bowl-winning teams across those drafts. The Jets grouping obviously doesn’t compare, but remember that Gang Green had an unprecedented four first-round picks the year after Parcells departed, using them to take Chad Pennington, John Abraham, Shaun Ellis, and Anthony Becht. Although Saints general manager Mickey Loomis was also suspended for eight games as part of the Bountygate fallout, his suspension doesn’t start until the beginning of the regular season, so he will still be running this year’s draft for the organization. Having Parcells’s voice around isn’t likely to hurt, but he won’t be drafting or developing the players of his choosing as part of the job, and that’s the thing he does as well as anybody on the planet. Finally, the last key component of every quick Parcells turnaround has been a significant upgrade at the quarterback spot. The Patriots, as mentioned earlier, replaced Hugh Millen with Drew Bledsoe. The Jets only got six games out of an injured Neil O’Donnell in 1996, but got 15 games from him in 1997, consigning fill-in Frank Reich to the history books. A similar situation occurred with Quincy Carter (playing the O’Donnell role) and Chad Hutchinson (the Reich role, I guess) in Dallas, even down to Vinny Testaverde replacing both O’Donnell and Carter. Then, in Miami, Parcells had Chad Pennington fall into his lap in August when the Jets fell for Brett Favre, giving them a Pro Bowl-caliber starter to replace Cleo Lemon and John Beck. In each situation, Parcells inherited a fractured quarterback situation and came out of it with much-improved play from a stable starter. The only exception came with the Giants, when Parcells chose to play the middling Scott Brunner over the expected starter, a bust of a draft pick who had thrown more interceptions (42) than touchdowns (39) over his first three seasons and was coming off a year spent on injured reserve. That guy came in for all of 13 passes as a sub that season before suffering another season-ending injury, a la Matt Leinart this past year. He, of course, was Phil Simms. The Saints will obviously not be upgrading at quarterback this offseason, which will make it more difficult for Parcells to apply his magic in improving the team. About 90 percent of teams around the league could benefit from giving Bill Parcells the keys to their football operations department and staying out of his way. Unless the organization chooses to move on from Payton and Parcells is comfortable taking his old assistant’s job on a permanent basis, the Saints aren’t one of those teams. The real benefit in having Parcells is his ability to draft and develop strong franchises built around a stout 3-4 defense over several seasons, and that’s precisely the opposite of what the Saints need right now. Nobody doubts that Parcells would be open to changing his style in 2012 while attempting to lead the Saints to another Super Bowl win in Payton’s absence, but there are also no guarantees that Bill Parcells can be Bill Parcells with a pass-happy offense, a 4-3 defense, and 53 players he didn’t scout, draft, and develop. There may not be a better option out there — the list of available head coaches more similar to Payton includes the likes of Mike Martz and Brian Billick — but Saints fans with high hopes for a brief Parcells era in New Orleans are likely to be disappointed if they get their wish.